A little itch here, a little flake there. While an occasional ticklish feeling on the scalp is normal, it's time to do some investigating when it persists and is accompanied by white matter in the hair. Two of the most common culprits -- dandruff and nits -- are sometimes hard to distinguish. Dermatological conditions, such as eczema and psoriasis, can cause dandruff, as can allergic reactions to hair products. A flaking scalp is most commonly associated with seborrheic dermatitis, chronic inflammation that appears in the form of oily, patchy spots. While the cause is unknown, overactive oil glands and yeast may play a role, according to the American Academy of Family Physicians. Nits are the eggs laid by lice, small insects notorious for scalp infestations. The female lays up to 10 nits daily, usually along the hairline at the back of the neck and around the ears. Nits look like tiny seeds firmly attached to the hair -- unlike flakes of dandruff. Using anti-dandruff shampoos can sometimes worsen a flaking problem, according to the International Journal of Trichology. If seborrheic dermatitis or other scalp maladies are diagnosed, you stand to get better relief from topical corticosteroids, anti-fungal agents and zinc preparations prescribed by your doctor. 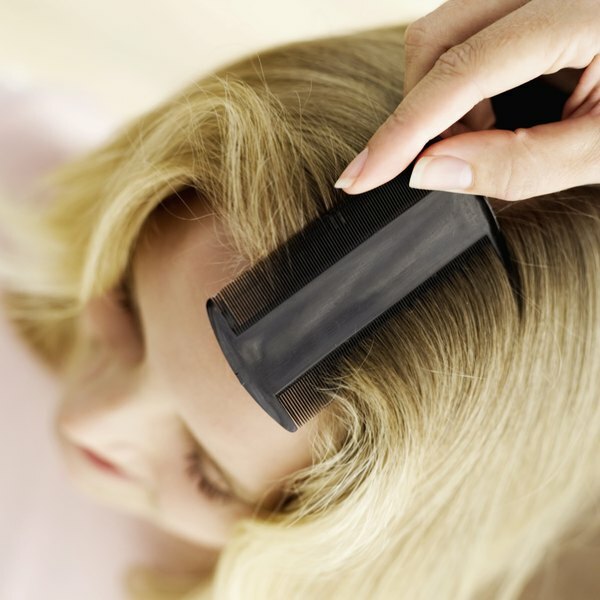 Nits can be removed from hair with a fine-toothed comb after killing lice with pesticide-containing hair products; two treatments might be necessary. While the journal, "Pediatrics," says this step isn't necessary to prevent the spread of lice, it can certainly reduce the "ick" factor.